Aerodynamicists use wind tunnels to test models of proposed aircraft and engine components. During a test, the model is placed in the test section of the tunnel and air is made to flow past the model. Various types of tests can be conducted in a wind tunnel. Force balances. are used to directly measure the aerodynamic forces and moments on the model. We must measure three forces (lift, drag, and side) and three moments (pitch, roll, and yaw) to determine all of the forces and moments on the model. There are several different methods for mounting the model inside the test section. The choice of mounting system in a particular wind tunnel is often driven by the type of balance being employed. For an external balance, measuring devices are located outside of the model and the tunnel. 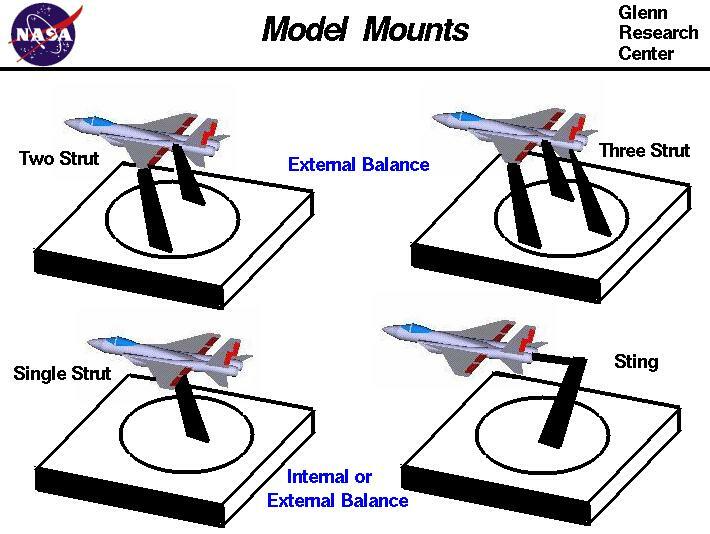 For an external balance, the mount must transmit the aerodynamic loads on the model to the external balance, and hold the model securely at the desired flight condition of angle of attack and angle of yaw. For an internal balance, the measuring devices are located inside the model. The mount does not have to transmit forces, but must provide a path for information to be passed from the model to data recording devices. Bundles of tubes for pressure measurements, or wires from strain gages must then be passed through the mount to the control room. The choice of balance type and the type of mount can also affect the data reduction for the model. On the figure, we show four different methods for mounting a fighter aircraft model in a tunnel and we shall discuss the advantages and disadvantages for each method. For all of the mounting systems, the struts are normally sheilded from the air in the tunnnel so that the drag of the struts themselves is not included in the drag of the aircraft. At the upper right, we have a three strut mount that connects to the model near both wing tips and at the aft end. The three strut mount is used most often with external balances; the bottom of the three struts connect to a platform that is instrumented with strain gages. With three movable struts, the angle of attack and roll angle can be accurately set and sustained while yaw is provided by turning the model on the circular section of the platform. The disadvantage of this system is the expense, complexity and maintenance for three movable struts. Aerodynamic interference between the struts and the model and flow blockage in the tunnel are also concerns for a three strut mount. Less expense, interference, and blockage can be obtained by the two strut mount at the upper left. But the two strut mount is less rigid than the three strut in pitch and roll. Even less expensive and with a minimum of interference and blockage is the single strut mounting system shown at the bottom. The single strut can be attached to the top or bottom of the model as shown at the left bottom, or it can be attached to the rear of the model, as a sting mount, as shown at the right bottom. The sting mount has less interference with the model flow field than the one strut mount, but the aft end of the model may be distorted to accept the sting mount. Single strut mounts are less rigid than multiple strut mounts. The single strut mount works very well with internal balances and flow diagnostics.